A screened-in porch can help you enjoy the outdoors without all the hassles. It goes without saying that a screen porch will grant you freedom from those pesky mosquitoes that invade otherwise calm summer nights. Everyone loves to sit outside on a peaceful evening, but nobody loves the itchy aftermath. 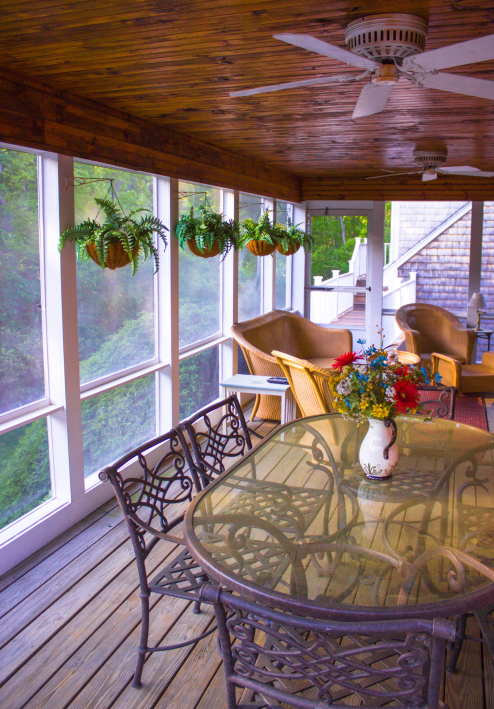 Evading a bug bite is just one small benefit that comes with a screen porch; read on to discover why a screen porch may be just what you’re looking for this summer, so you can enjoy the outdoors without the hassle. It provides additional living space. Your deck can be used for so many things when you get a screen porch. Of course, you’re able to sit outside on those summer nights. But during the day, and throughout other seasons, you’ll have access to an entirely different kind of living room. Add furniture, foliage, and artwork to customize your space and transform your porch into more than just a porch. You’ll be an entertainment star. Such an open, accessible space is bound to attract the attention of your guests, especially during summer months. When the cookouts are said and done, you’ll be able to relax on your furniture, safe from the elements, and enjoy the night while entertaining your guests. The space opens up the opportunity for so many conversations between friends and family alike. And you’ll never have to worry about a mosquito ruining your time! Natural lighting is the best lighting. They’re useful across the seasons. Don’t let summer be your only reason. Mid-Atlantic Deck & Fencing provides the option of vinyl paneling, meaning you will never have to worry about fluctuating temperatures that could keep you out of your living space. Screen porches can be used over the course of each season, so even if you can’t open the windows, you’ll be able to enjoy the peace and sunlight that comes with the outdoors. It doesn’t matter what kind of screen porch you’re after–Mid-Atlantic Deck & Fencing provides many different varieties of screen porches to fit your needs. We’ll help you work out how to care for your new space, and we’ll always be available for your screen porch questions. Are you ready to start looking for someone to install your screen porch? Mid- Atlantic Deck and Fence has been building custom fences and decks throughout Maryland since 1987. We also offer gazebos, pergolas, pagodas, and screen porches. Today, we are one of Maryland’s leading and most innovative deck and fence companies. Click Here to request an estimate today!